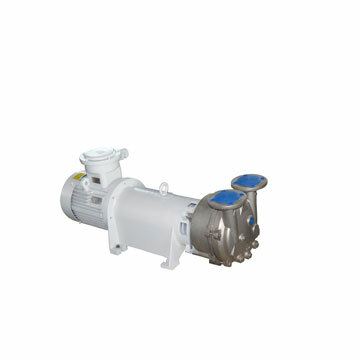 2BV series water ring vacuum pumps are suitable for pumping the gases and steam. Its suction pressure can reach 33mbar (Pabs) (i.e. 97 % vacuum degree). When the liquid ring vacuum pumps work under the condition near the limited vacuum for a long time, it is necessary to couple with the cavitation protection pipe in order to get rid of the screaming and protect the pump. If used as a compressor, its pressure is up to 0.26MPa (Pabs). 2BV series water ring vacuum pumps and compressors will replace the SK and 2SK series water ring pumps and the W, WY, WL series reciprocated vacuum pumps completely with their superior performance and advantages.